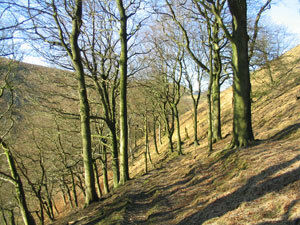 Length10.5 mile, 2030 feet ascent..
Includes Dobroyd Castle, a standing stone and Gorpley Clough. Emerging from Todmorden railway station, follow the road downhill to the left, turning left again passing under the railway bridge. Follow the narrow lane (Doghouse Lane) uphill passed the houses and then take the second signposted path on the left into the woods. Ascend the steep path through the woods following the short signed diversion. As we emerge from the wood we cross a step stile into a field. Now we follow the wall on our left to arrive at a gate next to a sheep pen. Passing through the gate we turn left along the wall heading directly for a small copse which we will pass on our left, to arrive at a gate in the wall near the top of the copse. Once through the gate, we keep the fence on our left and walk to the top of the field towards the finger post, pass through the gate at the top and turn left along a grassy track. With Dobroyd Castle on your left keep straight ahead at the next junction, and after 150m turn right in front of the iron fence and almost immediately left to emerge in a short distance onto a narrow metalled lane at Stones. 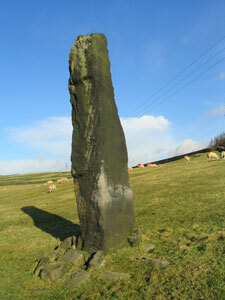 Turn right and follow the lane for 30m to see a large standing stone in the field on your right at SD925 235. Turn back to the junction of the paths and walk down the narrow road towards the telephone mast, turning off to the right after 100m and over a step stile into a field. Pass under the crags and turn left down the steep field, at the bottom turn right through a gateway and walk straight ahead across the next field to cross a deep gully and onwards towards Stones wood. Walk downwards through the wood, and descend some stone steps onto A681, turn right and cross over the road. Walk up the road for 230m then turn left into Gorpley Clough and follow the stream up. After admiring the waterfalls and crossing about 5 wooden bridges, turn up the stone steps on the right near the top of the clough. At the top of the steps turn right passing the waterworks building on your left.